I came across this recipe completely by accident. About a month ago I decided to make a Thai green curry from scratch, which meant making the green curry paste myself. I went to my local Asian market and bought everything I needed, including galangal which is similar to ginger. As I was cutting up the galangal, my fingers turned orange, so did my cutting board… I couldn’t figure out how this paste was going to stay green if I put this stuff in it. 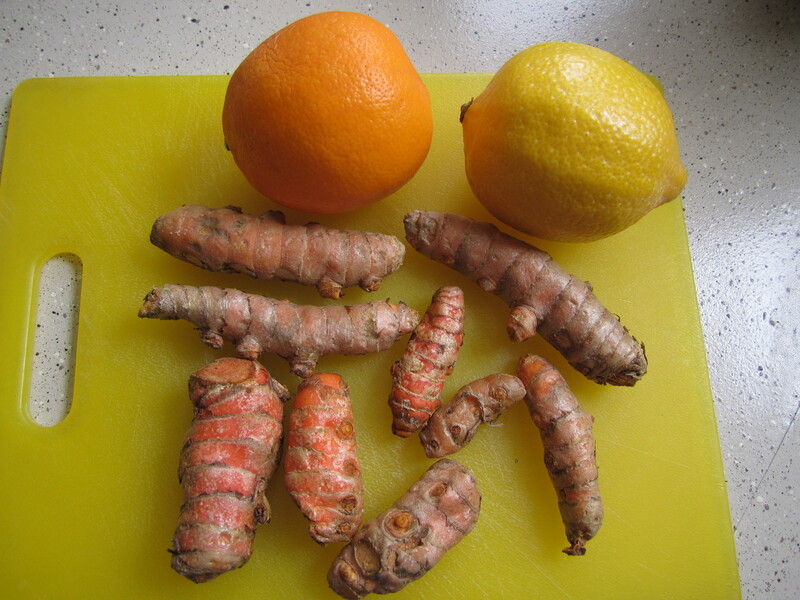 That’s when I realized I hadn’t bought galangal at all, I’d bought turmeric. A lot of turmeric. Asian markets in Arizona tend to sell their produce pre-packaged, so you can’t just buy 1 piece, you have to buy 12. I had like 10 pieces of turmeric I didn’t know what to do with now so I went on a Google search. 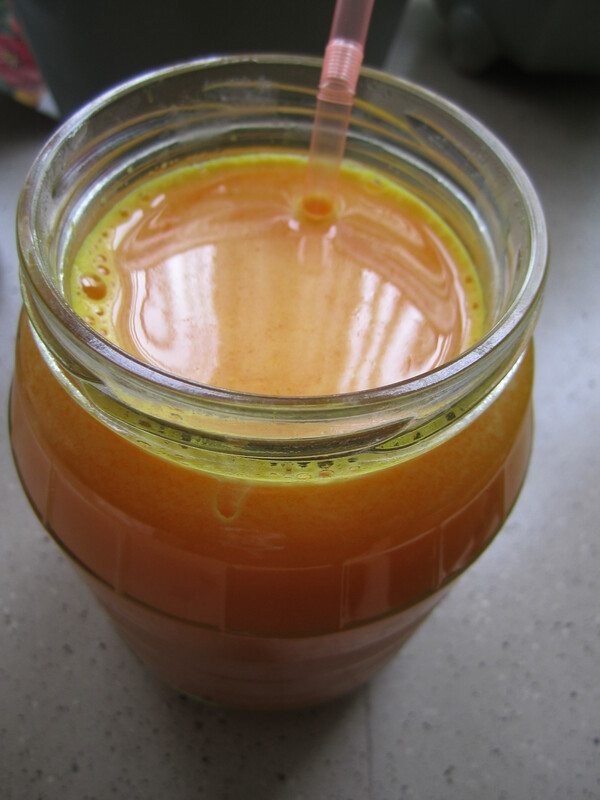 I found this recipe at http://www.terawarner.com/blog/2010/07/raw-recipes-fresh-turmeric-juice/ and I’m so happy I did because this drink is one of my favorite things now. I don’t know how to describe it cause it’s like nothing I’ve ever tasted, kind of peppery, slightly spicy, turmeric is in the ginger family but it’s much milder than ginger. I highly recommend trying this, just be aware that most likely your hands, counter and juicer will temporarily be stained an orangy-yellow. This is my slightly modified version. 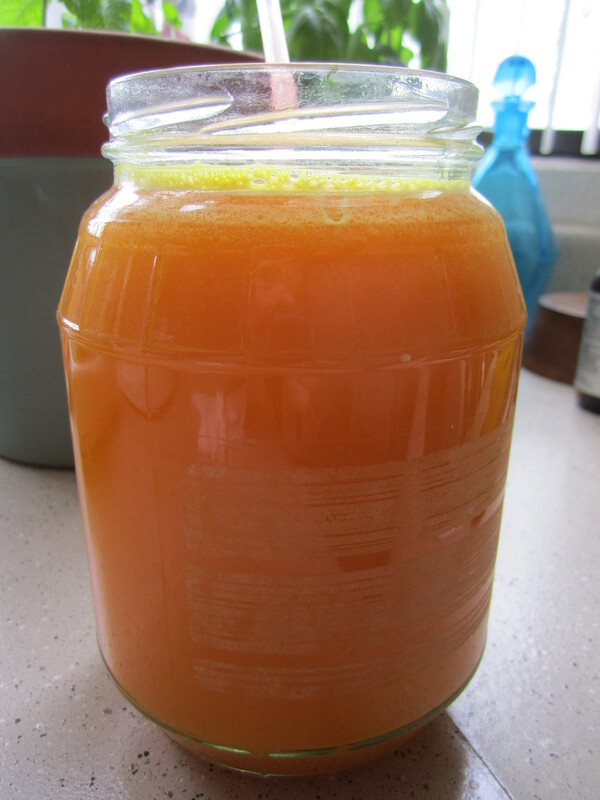 Put the turmeric and lemons through the juicer, into the jar. You can use 2 regular lemons if you don’t have a meyer lemon, just make sure one of the lemons is peeled. Run 1 cup warm water through the juicer to get all of the juice out. Mix in honey. Top off with cold water until the jar is filled. Enjoy! If you get a light buzzy feeling after drinking it, don’t be alarmed, this is normal! The first time I drank it I felt kind of loopy, I couldn’t stop laughing. Turmeric is great for your liver and immune system. Perfect if you have Grave’s Disease, like me.